A Hydraulic Hammer must always be positioned perpendicular to the material that it is breaking according to RJ Hydraulic Hammers and Heavy Parts. It is very important to follow this rule so that you can correctly test the hardness of the material. If not properly aligned, the hammer can respond as though it is working in light material, and yet remain in a high frequency but low impact mode. When the hydraulic hammer is properly aligned, it will select the best frequency impact combination for maximum performance with that material at that time. Please always refer to the Operator Manual as furnished by RJ Hydraulic Hammers and Heavy Excavator Parts, or call us at 1-888-651-0187. 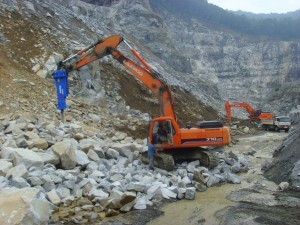 For more information about our full line of excavator attachments, please visit us on the web at www.besthammers.com.